When I first saw Michael Benjamin Lerner in the bathroom at the Middle East a few years ago, I had no idea I was about to fall hard for his band. I wrote about that first show here, and his first album made my top 5 of 2009. And now comes his follow up, 12 Desperate Straight Lines . There are two types of songs that get stuck in my head. There is the Katy Perry-esque treacle that gets played so frequently that it might as well be a commercial jingle. These are the types of songs that I want desperately to never hear again--they are the musical equivalent of Chinese water torture. You know the song is going to come at you again eventually, so your brain seems to mentally prepare itself. This is not the good way to get a song stuck in your head. Then there are songs like Lerner's. His songs will have a hook that creates a mental itch, and the only way to scratch that itch is to listen to the song again. And again. Soon you've got the album on the MP3-player equivalent of speed dial. Or, if you're an archaic old fart like me, you carry the CD around with you everywhere. 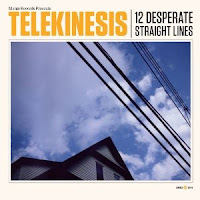 Telekinesis - Dirty Thing from Merge Records on Vimeo. I challenge you to listen to this song twice and NOT get the "chorus" stuck in your head. I use quotation marks since I don't know if you can call it a chorus if it doesn't have words, but you'll know what I'm talking about when you listen to it. And this is one of many great songs on the album. Merge has been on a pretty incredible streak as of late, and Telekinesis is probably one of their more underrated bands right now. Whenever a sophomore album equals--or in this case, maybe even surpasses--a strong debut, there's cause to celebrate. Or at the very least, cause to listen.